WASHINGTON (CNN) -- The United States on Friday sent another long-range signal to North Korea that it is willing to talk one-on-one if that would restart negotiations on how to dismantle Pyongyang's nuclear weapons program. 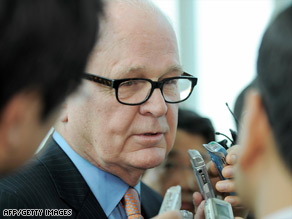 Special envoy for North Korea policy Stephen Bosworth, in South Korea Friday, wants six-party talks to resume. State Department spokesman Robert Wood said the United States is ready to act alone if that would persuade North Korea to return to the six-party talks that stalled in the final months of the Bush administration. North Korea has refused to sit down with the other members of those talks -- the United States, Japan, Russia, China and South Korea. Relations deteriorated further in recent weeks after the North Korean regime launched a rocket, expelled international inspectors and threatened to restart its nuclear reactor and test another nuclear bomb. The United States has repeatedly said that bilateral talks would supplement -- not replace -- the multilateral talks. The Obama administration's special envoy for North Korea policy, long-time diplomat and academic Stephen Bosworth, is touring Asian capitals discussing how to end the stalemate. He met with South Korean officials on Friday, Wood said, and will be in Tokyo on Monday before returning to Washington. "Ambassador Bosworth and [South] Korean officials agreed that our views about recent developments in North Korea and the way forward are similar," Wood said at his morning briefing at the State Department. "They agreed that the six-party process remains the heart of the effort to achieve the goal of a verifiable denuclearization of the Korean Peninsula, [and] that the United States is prepared to deal with North Korean bilaterally in a way that reinforces the multilateral process." He added, "We have held [previous] bilateral talks with the North in the context of the six-party framework. That's the way it's been." Wood said Bosworth has no plans to add North Korea to his itinerary on the trip. "I'm not going to rule anything out. ... I'm not going to rule out that we may have talks at some point with the North. Our purpose is to get the North back to the six-party talks," he said. U.S. Secretary of State Hillary Clinton said last week that she considers it "implausible, if not impossible" that the North Koreans would come back to the table. Clinton also said the United States would not provide additional aid to North Korea if it didn't return to the nuclear talks. At the time, some experts questioned Clinton's hard line. Heritage Foundation analyst Bruce Klingner -- who worked in the U.S. intelligence community -- said many Korea-watchers might be surprised by Clinton's statement that it may be impossible for North Korean talks to resume. "It may be true, but it is not productive," Klingner said in a telephone interview. "It seems to be closing the door. And the obvious question is, 'What's next?'" He also questioned whether the United States and the countries it has worked with are ready to accept a nuclear-armed North Korea with the long-term ability to increase its own nuclear arsenal as well as spread material and expertise to others.